What a season of life I am in right now. I am currently homeschooling two boys who would be considered 4th grade and 2nd according to their age. I also have a preschooler and new baby. What a juggling act! How on earth do I make sure each every child gets what he or she needs emotionally, spiritually, and academically? How do I make sure I get what I, the momma running this ship, needs physically and emotionally? How do I care for my husband and my home? How do I care for my friendships and other relationships. Ok, I just exhausted myself writing all of that. I’m headed back to BED! Just kidding! That won’t help much. 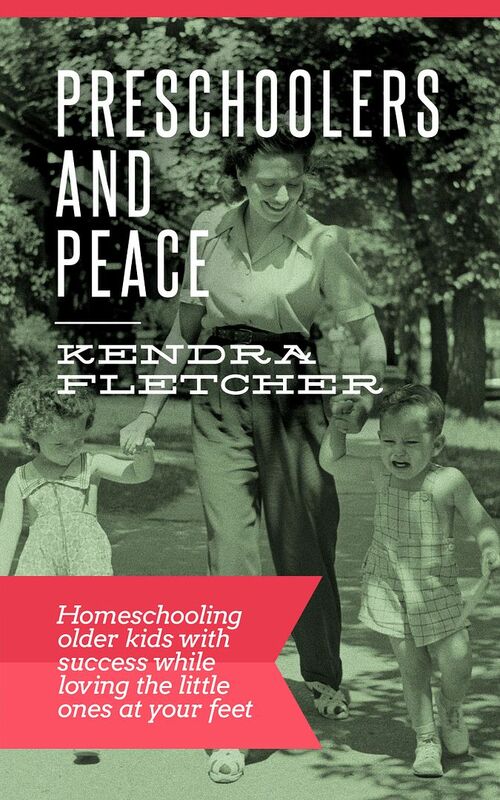 However, I was given this new ebook, written for mothers to review, by Kendra Fletcher who blogs at Preschoolers and Peace titled Preschoolers and Peace: Homeschooling older kids with success while loving the little ones at your feet. God surely knew what He was doing when He sent this book my way! What perfect timing don’t you think? What a treasure this book is! Truly! There is no denying it. I knew it would be! Kendra is a homeschool veteran and mom of many! She’s spent 15 years homeschooling, pregnant, postpartum, and/or nursing baby. This lady has the wisdom I NEED right now! In this 47 page ebook (isn’t that sweet? 47 pages! I read this in a day over a couple of nursing sessions) Kendra brings you right back to the place we should all begin. To that thing all Homeschooling Moms need… in prayer with God. The opening pages renewed my commitment to begin each day laying it all out with God and asking Him to guide my every step. I know I can’t run this crazy life without him and our days go so better when I start sitting at the feet of the one who truly knows all. A few other chapters really jumped out at me. I really appreciated the chapter on Planning Around Preschoolers. She and I think alike as we both believe in getting kids into good habits that not only make our days run smoothly, but hopefully they will take with them one day when the fly the nest. Getting our days off to the right start, first with prayer and then with good habits, truly sets the tone for the day. Even in this section where Kendra talks about creating schedules she takes it back to where we really need to be. The very first step? Pray and ask God for direction. I don’t do that the way I should. I admit, I’m guilty of creating a grand plan and asking God to bless it instead of ask Him what His plans are. I’m always more successful when I ask Him first. Kendra also reminds us to ask our husbands for their input. After all, they should be involved where they can be too. Other points include writing down what needs to be done, determining what can be done with toddlers about, brainstorming how to keep the little ones busy, and using your schedule as a tool that serves you. I love that she even lays out a sample schedule for you so that can start gaining some sort of vision for where to start! Another chapter that I had to skip right too is titled… How Do I Get Any Preschooling Done? Oh my word! Trying to fit some great school time in with my preschooler is HARD! I was dieing to learn how Kendra does it in her big family. Her number one piece of advice… RELAX! At the end of the ebook you’ll find tips for meal planning, additional encouragement, and some great handy resources. She includes some fantastic links to great places for more help. My family was blessed to welcome a precious baby into our family just 7 weeks ago. Ever since life has been a whirlwind. My older children are totally enamored with this little princess. Mommy and Daddy are busier than ever and totally sleep deprived. It comes with the territory though doesn’t it? To say our homeschool routine has be upheaved would be an understatement. I’ve definitely had to make some pretty big adjustments to keep this ship on course and I thought I’d share a few of them with you today. 1. My older children won’t be deprived. I battle feelings of guilt when I totally tell myself that my older children would all have such a better educational experience if we didn’t have to stop to love on and take care of their baby sister. Nothing says crazy like Mommy jumping up from some lesson to change clothes (and diapers, and baby clothes) because the baby had a blowout. In the end though my children gain so much more! They learn how to adapt and put others before them. They learn a bit more independence. They learn to serve when they help each other or their poor mom get through to the next thing. No school lesson will ever really teach any of that. 2. There are alternatives to big, crazy hands-on, flashy, pinterest filled school lessons! There has to be because I’m too tired and too stressed to put that much effort into school. I’ve had to mostly give these things up. Instead I’m opted for read alouds. We have ALWAYS read aloud… a lot. Now I lean on it even more. Almost all of our curriculum I can do from the comfort of my rocking chair with a nursing baby in my lap. I’m starting to realize that I actually adore this. Such sweet time snuggled together as a family. For those times when I just can’t read any more… there are ALWAYS audiobooks. Just today we listening to and comparing various styles of poetry… all thanks to audiobooks. 3. Just when you think you’ve got a routine down pat, the baby will enter a new stage and you’ll need to readjust. I’m learning I have to be okay with readjusting. I need to do it nearly daily. Each day someone in this house needs something different. So we adjust. 4. It’s okay to have a quiet time in your day. Yes! Even my 4th grader has to lay down with a book each and every day for an entire hour. Praise God for this quiet time. Dare I admit, I nod off from time to time when I need to. Moms, cut yourself some slack and find rest in your day. You’ll be that much better for it. 5. If your kids are like mine they adore ADORE their little baby beyond belief. So much so that they actually DRIVE ME CRAZY trying to love on the poor thing. She’s a distraction because they think every sound she makes is just oh so cute. So… I’ve built in baby time. Time when each sibling takes turns “being in charge” of the baby. Not only does this satisfy their baby craving… a bit. It also makes the older kiddos feel important, and competent. It teaches them how to love and put others first. It cements the bonds between the siblings. If you go back and read my five points again you’ll see this… these days aren’t so much about learning facts and figures, honing our math skills, or sharpening our writing proes. It is about family. It is about celebrating a the precious gift that is our new baby. It is about learning to love one another in a whole new way. These lessons are the most valuable. My Biggest Homeschool Lesson This Year… Letting My Agenda Go! I have to tell you… I have been ALL OVER THE PLACE with our homeschool this year! I began the fall with a perfect plan… but life and sickness sent us on some detours. Sure we still schooled, just the basics mostly. And I read to them… a lot! Ok so it wasn’t so bad I guess! I can’t help but mourn what we didn’t do though. I came back in January! No more fooling around we WILL get our Middle Ages Study done. Except, we didn’t. Yep we still schooled the basics, and read a lot, and we did a lot of other things too. Field trip after field trip, co-op classes, horses, you name it! We had a ball. But darn that Middle Ages Study! So now its spring. Time to double down! I WILL get everything done in the next WEEK that we haven’t finished yet this year. Ok, maybe not. But I’m certainly going to have an ambitious agenda so we catch up… at least a little. I printed lesson lists every day. We could not be done with our day until absolutely EVERYTHING on that list is done and I do not CARE if a lesson takes 5 times longer than I thought it would. If it is on the list it MUST be done! I bribed them with trips to the park or the pool if we get it all done. We accomplished a lot, but I was stressed and so were they! Where is the fun? Where is the adventure? When do they get to study what THEY want to study. I admit it, I even shed a few tears over it all. I’m just trying to be the best homeschool mom I can possibly be DARN IT! Why does it have to be so hard? I was driving myself insane. I am sure I was also driving my children up a wall too. I’m not even sure I was all that pleasant with my husband either. So what’s a mom to do? Well I did the only sensible thing I could. I gave up! Alright I didn’t stop schooling my kids. I didn’t turn down the unschooler path either, though I am starting to read more about it… stay tuned, Lord only knows what I’ll do with that information… but that is for another blog post. Instead I just let my agenda go. I ripped it to shreds and I asked the kids… What do YOU want out of our day? I kept a few non negotiable things. We will dive into God’s word EVERY DAY We will study math every day. . We WILL become good readers and writers. But after that… it was all fair game. Now I ask the kids what we should work on next. It’s now all up to them. Occasionally I even let them opt out of an activity. Like just today, I did suggest we work on some art but my 6 year old pushed back. We been doing a lot of painting and it isn’t his thing. He doesn’t enjoy it at all! He likes to glue and sculpt and smoosh and shape. He finds paint too difficult to control. Math however? MATH is his love! I suggested that he simply listen to the art lesson and then he could do this other extra math thing I have to review instead of actually painting. My 8 year old LOVES painting and really couldn’t give a darn about math. It was win win! They got to do what they love and I even got to cross off of my to-do list something I needed SOMEONE to do. Lessons now end at a logical time as well. I have no set agenda. We’ll work at this until we hit a good stopping point or we get tired of it. Then we’ll move on! The pressure, the stress is GONE! Who exactly was I trying to catch up to anyway? That doesn’t mean I don’t guide them a bit. I might say things like, “Well we could do that, but we haven’t done art in a couple of weeks, are you interested?” But then I do my best to go with THEIR suggestions. The results? AMAZING! We are getting more done in a day than we ever have. We are ENJOYING our work and each other. We are engaged, excited, and HAPPY once again. No more agenda’s! That’s my new mantra! Will someone remind me of this in the fall? 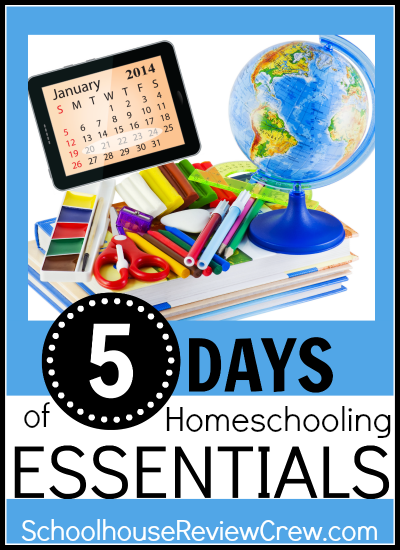 5 Days of Homeschool Essentials – Support! Today is day 5 of Homeschool Essentials. It’s been a good week. I pray my posts have been a blessing. On day 1 I shared with you our most essential object, Our Child Training Bible. On day 2 I talked all about our precious books! On day 3I shared our art supplies! Yesterday I talked about needing a bit margin and time in our lives. On this final day I want to talk to you about homeschooling in a supportive environment. Let’s face it, if the world is against you homeschooling you will have an exhaustive uphill battle that you will like give up on. My support comes from a few places. Let me tell you about my main support first… my husband. My husband Todd is my backbone. He pushes me to never ever give up on any of my dreams. He is my biggest cheerleader. He is that soft place to fall when things don’t go right. He is my go- to person when I need to pick someone’s brain to figure out a problem. He is the one who works his rear-end off at work in order to provide for every book, every art supply, all of our field trips, not to mention the roof over our head, the food in our belly, and the heat that pours from the furnace. On top of all of that he pitches in around the house and even picks up my slack when life overwhelms me just a bit. All of these things are super important and I can’t imagine taking on the enormous task of homeschooling our children without him doing all of these things. But there is one other thing that is even more important. My husband believes in homeschooling probably even more than I do. He has made it a priority in our home. He made the decision that come heck or high water, these kids will be homeschooled. My husband will stop at nothing to ensure our children are always homeschooled. That attitude legitimizes what I do and places a tremendous value on my roll in our family. It makes my burden light. As a member of the Schoolhouse Review Crew I have been given some pretty amazing opportunities. First, I’m connected to homeschoolers all over the world. I’ve been friends, if only through cyber space, with some pretty amazing moms whom I never ever would have had the chance to meet. We have our own little private place on the web where we pray for one another, support, encourage, laugh, and share with each other. Sometimes they even set me straight when I’ve headed in the wrong direction. They are a huge resource for me that can’t be replicated any place else. I’ve learned about homeschooling programs, methods, and curriculum I’d have never ever heard of. On top of that my children are blessed with learning opportunities I couldn’t provide otherwise. Through the crew I am provided with all kinds of curriculum from all sorts of vendors to review. Some of the materials we receive become a part of our core curriculum which frees up our finances for other things. At other times the crew gives us the opportunity to learn extra subjects we could never afford. Through the crew my children have been learning Spanish, guitar, piano, chess, current world topics, and so much more I couldn’t list it all. I can no longer imagine homeschooling without the crew. Not to be left out of the conversation is my local homeschool community. Every year the number of homeschoolers in the area we live continues to grow. We have the opportunity to participate in co-ops, fieldtrips, and playdates with so many friends. Mommy has the chance to socialize with real life friends face to face with Mom’s night out and other events. 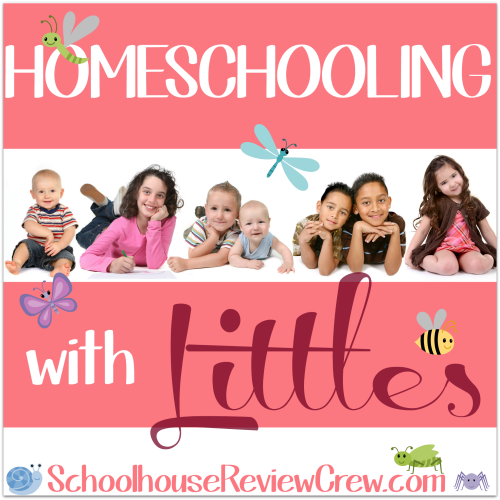 Homeschooling would be a lonely adventure without our local homeschool community. These are my own personal supports that make my job as a homeschool mom so much easier. I couldn’t imagine flying this gig solo. I thank God every day for the people and opportunities He has put in my life. If you are considering homeschooling do take serious stock of the help you’ll have. You’ll be happier and your children more successful if you have a helping hand and a shoulder to lean on along the way. Today is day 4 of Homeschool Essentials. I hope you are finding this series helpful and enjoyable. On day 1 I shared with you our most essential object, Our Child Training Bible. On day 2 I talked all about our precious books! Yesterday I shared our art supplies! Today I want to talk about something that isn’t tangible. It isn’t something you can purchase from Staples or some on-line store. You don’t need to store it. You may need to organize it, but not too much. What could it be? I’m talking about TIME! In my post yesterday about art supplies I described for you some the wonderful hands-on projects my children create for themselves, almost everyday, from things they see in books and art supplies. These are projects that I could research, invent myself and assign to them, and I do do that occasionally . Don’t get me wrong sometimes Mommy has awesome ideas that we all enjoy immensely. However, it is the self-guided and ever evolving projects that my children learn the most from, enjoy like no other, and carry memories of for ages. Yesterday I told you about our on-going cardboard castle project that seems to spring back to life every time I think we might be done with it. That is their project that THEY invented, and continue to tweak. Mommy had a very cool castle project too. We made a castle from sugar cubes together. It was a great time! We worked hard on it for several days. They all thought it came out awesome and it was a tool for discussing Medieval Castles and their features. I invited the boys to bring their Lego guys down as I thought for sure they’d spend a week dreaming up Medieval stories around this thing. You know what? They didn’t. Once we finished it they barely touched it again. That project came from me, not them. What they did do is take some of what we learned together during that project and… you guessed it, implemented into their cardboard castle. Big, in-depth, self-directed projects (the very type of activities they learn THE MOST from) do not come to be if you do not leave margin in your life. Time! Precious time. Children need to be given the time to learn deeply and widely. The time and space to tinker, explore, experiment, tweak, research, change, modify, fail, and try again. Without that luxury is their education really any different that what they could receive in a traditional school? The opportunities for homeschoolers today are astounding! In our own family we have church, guitar and piano lessons, 7 karate classes a week, basketball practice and basketball games, horse lover’s club, occasional cooking classes, co-op opportunities, library classes, homeschool days at various museums, field trips galore, and the list goes on. We could quite literally have some place to go and something to do almost every minute of every day. For awhile I fell into the trap of saying yes to just about EVERYTHING. I dragged my children around non stop day-in and day-out. If we ever did manage to stay home I was cramming curriculum into them like there was no tomorrow. I was exhausted, they were overwhelmed, and no one was truly learning anything of value. Thankfully I realized I had to put a stop to the insanity. We pulled back from a few activities, slowed down our daily curriculum, and took some time to BREATH! We reprioritized and our days are much better for it. We now attend the things we love, work on the subjects most important to our family, and then leave a good chunk of the week for exploration. Most of our schoolwork is typically done by about one in the afternoon. After that the children are free to do as they wish. Screens are off limits (TV/computer games/tablet apps) but that is it. Usually they tackle a book, or a stack of books. Often this leads to some new dreamed up project like those I described already. It is truly amazing how far children can go with resources and time. Oh, and a Momma willing to step back and get out of the way! 5 Days of Homeschool Essentials – Art Supplies! Today is day 3 of Homeschool Essentials. On day 1 I shared with you our most essential object, Our Child Training Bible. On day 2 I talked all about our precious books! Today I want to tell you about our art supplies! Why art supplies? Art supplies open up the world to my children so that they can take what they have learned and manipulate it, engage it, practice it, and expand on it. In our home my children will devour a stack of books on a topic and then go and create their very own projects with our art supplies based on what they learned. Let me give you an example. This year we are neck deep in a study of the Medieval Period. We have had a blast with this topic. What little boys wouldn’t? Medieval means knights, castles, sword fights, jousting, and horses. Our library cart has been filled to the BRIM with every book our library can find on the subject. They’ve poured over these books for hours. Eventually these books find their way to our art table. Nearby is a cabinet filled to the brim with paints, pastels, construction paper, scissors, colored pencils, water colors, markers, drawing pencils, glue, craft sticks…. you name it! Supplies come flying out and they spend hours inventing the very things they read about in the books. If things go well they’ll use their creations to reenact the stories in the books they read. This process goes on for weeks. I can sit back and watch immense amounts of problem solving, planning, negotiating with one another, rethinking, retooling, improvising, and improving. I have learned the best learning happens when I don’t interfere. My job is provide the materials and perhaps some advice if asked. That’s it! The art table – though most projects end up so big they do them all over the house. So far this year they’ve created a room sized castle from cardboard with GREAT detail. They beg cardboard from just about anyone. Fortunately for them their grandparents work in a place with an abundant supply! The castle comes down and goes back up, refined, from time to time. They made their own catapults, bows and arrows, and long spears. Noah (8) wrote an illustrated book on everything he knew about the Middles Ages. Yes, my 8 year old son wrote a BOOK! It was all his own idea. He used the supplies I have on hand, and created what I would have called a report if I had assigned it. I didn’t assign it though, he dreamt it up on his own, and I would say he did a far stellar job because it came from HIM, not me. We do have rules for the art supplies. They do have to ask me before they take something out but ONLY because I don’t want them digging out all of the paints 15 minutes before we have to leave for an appointment. It is also up to them to clean up everything every time. If they do not then they will lose access that thing they left out. No one wants that to happen. They do a good job over all. A display board they turned into a castle wall complete with hanging Medieval weapons. Between the books and the art supplies my children engage in learning in a deeper and broader way than I ever would have imagined. My role is to provide the stuff and then get out of their way. Yes, an abundance of art supplies… essential to our homeschool! 5 Days of Homeschool Essentials – The Child Training Bible! I often get asked by potential homeschooling families what you REALLY need to get started homeschooling. They are asking about STUFF. Many see grand dollar signs in their eyes thinking homeschooling will set them back a pretty penny. You know what, it CAN! But it doesn’t have to. This week I’m going to talk about a few great things that you can invest in to make your homeschool a success. Most are low cost to no cost, others simply make sense because they will save you money, a few you most likely already own. Let’s get started with the single most important item in our family’s homeschool arsenal. We are a Christian family so it should be of no surprise to anyone that the most important thing we own is our Bible. We use an NIV Bible that I’ve doctored up with the help of the people who created the Child Training Bible (CTB). The Child Training Bible helps me quickly find scriptures that address the most typical heart and character issues all children (an even adults) struggle with most. Every day we begin with a family prayer to God. We ask Him to help us in our day, to show us places where we can grow to be more like Jesus, and to open our hearts to His teaching in His word. Then we crack open our CTB. Back in the spring of 2012 when I first got our CTB materials I spent some time assembling our Bible. I wrote all about how do that and just what you need to get it all done HERE. As you can see from that old blog post I loved this resource then and I think I love it even more now. Each day we choose a new topic to study for the day. Sometimes Mommy has noticed some heart issues in our home and I’ll choose our topic. Other times the children let me know there is something they really want to hear about. We just go with whatever we are feeling lead to at the time. Once the topic is chosen we use the tabs to find the appropriate scriptures and work through 4 or 5. We read them, discuss them, break them down, recall times when we (including Mommy) have struggled with what that verse is teaching us, we use the verse to discuss what God thinks is the best ways for us to handle problems, and finally we pray together. Some of our favorite topics include Anger, Complaining, Fear, Jealousy, Lying, Making Excuses, Quarreling, Selfishness, and Tattling. God’s word works miracles! It never fails, after studying a topic I always noticed the issue at hand decreases greatly or is eliminated altogether… at least until we need to study that one again. My six year old in particular adores our CTB time. Sometimes after a long day he’ll even tell me that our reading really helped him that day. Praise God for that! There just aren’t enough words for me to tell you how vital our CTB is to our homeschool. It is our most important Homeschooling Essential. Sneaking School Into Busy Days… How We Learn Every Day On The Go! I believe the most authentic learning doesn’t necessarily happen during our “school” time. Some of our best educational experiences these days are happening in the in between times, often away from home, while on the go, and even on weekends. I try to find teachable moments in the everyday things we have to do in our lives. Let me give you a peek! There is a shift happening in our homeschool! Wait, actually there isn’t. The shift isn’t in our homeschool… it’s in the perspective of this homeschooling mom. I used to think real learning only happened during our “school time.” This year I’m realizing the real learning actually happens ALL of the time! In the whopping 3 weeks since our “first day of school” my family has been busier than EVER! It is fall. It is the busy season for my photography business. My husband has been buried up to his EYEBALLS in a training course for work. Our dog is sick. Our ministries are active. And the field trip opportunities seem to be endless. Truth be told… we are lucky to get 2 “normal” schooling days in in a week. TWO! Yet, my children have learned more in 3 weeks than I can even wrap my brain around. Let me tell you how I’ve accomplished this. 1. Let them teach themselves! I have been blessed with excellent and excited readers. The reading culture is one that I’ve carefully cultivated in our home since they were born. My children get incredibly limited screen time (TV, Video games, computers etc.) and I think that has helped them grow a love for reading. They go to bed and wake up with a book in hand. They read far beyond their age level. It’s glorious and a blessing I refuse to take for granted. Every couple of weeks we head to the library and come home with a CART full of books. We leave with no less than 50 at a time. MANY of these books are informational in nature. They choose books based on their interests and I choose books based on the topic we are pursuing in our homeschool. They learn more from the books than I could EVER dream of teaching them myself. In fact, they usually teach me about what THEY have learned. The books inspire their creativity! It is a common occurrence that my boys will see something in a book and then go off and try and create their own version. This year we are studying the middle ages. They saw a project in a book about making knights chainmail armour with aluminum foil and they set about making it. And while they completed that project they looked at other books with information about chainmail armor so they could be sure they got their project right. Then they appeared covered in aluminum foil spouting off information about chainmail armor that I never knew. All of this happened in the evening during what is supposed to be “non-school” time while Daddy was cooking dinner and Mommy was trying to catch up on photo editing. Its a project I could have conjured up… but I don’t know when I would have found the time. Somehow I bet they learned more as the project came from them and not from me. An extension of reading above, and great for the child who isn’t into reading, audio books can bring learning alive while letting Mom or dad off the of the hook to do other things. My children ADORE listening to audio books purchases from audible.com or borrowed from the library while they create with Legos. I end up with time to tackle another project or work with my preschooler while they learn. Once in awhile I can find a GREAT documentary on a topic of interest. In 2 hours they can learn more about something than I ever could teach them in a week. This isn’t limited to Netflix either. Checkout Youtube and Amazon too. We recently watched a Discovery documentary on “Going Medieval.” They’ve been refining their Lego castles and their “Castle” fort (a full size homemade replica of a castle – at least according to their imagination) ever since. We spend quite a bit of time in the van these days. Whether we are driving to Karate, a field trip, to church, or the grocery store… children are captive audiences when strapped into the car! This is another place where audiobooks can come in handy. We’ve also sung songs to help us learn math facts and chanted rhymes to help us with other memory work. Carschooling can be a very efficient use of time. This is when you use your everyday life to teach your children. Recently we needed to make cupcakes to celebrate my mother-in-law’s birthday. Ezra loves to cook. So he and my husband banded together to get the job done. First they researched recipes, then they create shopping lists, after that they went shopping where they read and compare labels. They kept a running total of items in the cart to ensure they stayed in budget. They also counted out the cash to give to the cashier. Something makes me believe my Ezra is far more likely to remember what a quarter looks like and how much it is worth after experiences like these than if he had just filled out a bunch of worksheets. Then of course at home they had to do the actual cooking and measuring and fractions and all that goes into the actual baking! Literacy/math/science etc… all rolled up into something that had to be done anyways. With Joyanna, as a preschooler she’s had to learn everything as we go and I’m amazed by her. With her brothers I carefully took the time to teach them colors and shapes and number and letters. It was deliberate and planned learning on my part. With her… well… I haven’t been so deliberate and planned and yet she is learning it all. It seems our snuggle time with books and chatty conversations as we move throughout the day have taught her much though I am always trying to keep her in mind and come up with projects just for her. Children really do learn through life. I recently took my older son out to a church event with me. It was prayer walk. Our church is sponsoring a 5k run to raise funds and awareness for human trafficking in our country. We set out to cover the track in prayer for the upcoming event. The number of things I had the opportunity to teach my son in this 90 minute outing are too many to list. Of course we had the opportunity to discuss this important social issue and the impact of it. Then there was the conversation around WHY God allows things like this in our world. There was the opportunity for me to model for him how and what to pray for in this situation. I also found myself passing along lessons about how to engage the other members of the prayer team, how to respect them on the track during their prayer time, and how we can come together as a church body to pray. This Thursday I plan to take my entire family to our state capitol to pray for persecuted Christians during a prayer vigil my husband has organized in conjunction with prayer vigils around the world. We’ve been preparing with conversations about what persecution means, with maps that have been poured over as we discuss how Christians are treated around the world, and with study of God’s word. If these last two examples aren’t meaningful lessons in civics, geography, cultural differences, and religion than I don’t know what else I could possibly add. 5. Children can teach one another. I see this all of the time in my own. One child will learning something cool (usually through a book) and then enthusiastically share it with his brother or sister. I often hear… “Hey Ezra, did you know medieval knights….” or “Noah, I just read castles….” My boys also love to read to their sister. She gets a lot of attention from them. I think I might take this to the next step and see if I can get them involved in some learning games with her from time to time. I think they’d all get a lot out of that experience. Schooling in the business really can be done! Yes, sometimes we only “do school” twice a week. I am coming to realize this doesn’t hinder my children’s education, if anything the limited “school” time allows them the freedom to engage in their world and learn more authentic and longer lasting lessons than daily time with workbooks and textbooks might otherwise afford them. To read about how other homeschool moms sneak school into busy days click here. Most homeschool families rely primarily on one income. Even ours! Yes I do have my own photography business and that certainly helps our family budget, but the truth is, what I make part-time pales in comparison to my husband’s salary. Living on one income isn’t easy. Adding in costs for homeschool materials can really throw a budget for a loop. Let’s talk about how to get your children a great education for nearly nothing. I am saying “nearly nothing” instead of free because I don’t believe you can truly do it for FREE. Paper and pencils and related supplies do cost money and you’ll need a bit for gas or the bus to get to the library and perhaps other locations too. Also, a number of my suggestions do involve internet access. But other than that, I do think you can homeschool without spending a penny. I begin here because let’s face it. If you aren’t able to teach some basics… reading/writing/math… then you are sunk. Science and Social Studies fit in here too! How do you do it? How do you teach these important subjects without shelling out big bucks for expensive books and curriculum? I’ll give you one word… the library. If you can get to a library you can find plenty of books on these subjects. Take from them what you can. Since these probably aren’t going to be open and go curriculum type books chances are you’ll need to take some time to read through them and develop your own plan. But a plan is doable. In my home state we have a fantastic library loan system. Using the library’s computer I can request books from any library in the state and they’ll be shipped right to MY library. I’ve heard other states offer this too. In our case it is free. I do believe some states charge either per book or per request. This service can be a true lifesaver. In some areas of my state there is something called the Book Mobile. This is a van full of books that travels to areas where families might have more trouble traveling to the library. I’ve been told that if you get to know the driver you might be able request books of interest. Something to look into for sure if you are homebound. that from they almost always say… “A book!” When we hit the library we bring home no fewer than 50 books at time. We keep a big basket in the living room filled with them. Every day my children have a “reading time” where they pull books from that pile – and others in the house – and read to their hearts content. We read books aloud together every day. It’s just a part of what we do as a family. I often tell my husband I should probably just abandon most of our curriculum and just let them read themselves into forever. They seem to learn just fine without my “lessons.” A stack of books on their topic of choice equals quite a bit of education. If you have access to a computer, an old smartphone or an ipod touch, or even a handme down tablet or e-reader then you can log onto Amazon.com and download THOUSANDS of books for free! They change daily so weekly checkups are a must. Check out freereadfeed.com. They are a great source for finding Kindle freebies any time. You’ll find free books on pretty much any subject you are interested in. Not too long ago I posted a list of free and frugal resources for homeschooling on the cheap from around the web. You’ll want to check that out. We are blessed that we have family that love to lend us a hand in our schooling. My brother-in-law was gracious enough to buy us a family pass to the local Science Museum. Of course we can go as often as we’d like but even better is when our museum partners with other museums. When that happens we get to visit other places for free! This month we are hitting up Old Sturbridge village as many times as we can saving our family $75 each time. In March we’ll get to visit Mystic Aquarium saving our family over $100 each trip. Our local library also has passes you can borrow to various destinations. Plus, it isn’t uncommon for some establishments to offer free days. There is an Art Museum here that does so once a month. There are other recipricol museum passes available as well. Some will allow you to tour children’s museums and others science museums at a reduced cost. If you are super lucky you can get a membership that covers both! The Boston Children’s museum offers this. You don’t have to live in Boston to get it and it covers thousands of museums around the country. Something to look into! here in CT. It was March and we were blessed with very balmy weather. We didn’t pay a penny to park or enter. We spread out a blanket, had a picnic lunch, and traipsed the shoreline collecting treasures we then sketched and identified using our library books. Later at home we wrote stories about our beach adventure. In other words I put together an entire month long unit on oceans and sea life, one that contained rich hands-on immersive experiences… FOR FREE! Ok, I had to pay for gas to get to and from our destinations. It included Science, Social Studies, Reading, Writing, Art… I got it all in and it didn’t cost a thing. The world wide web is a TREASURE trove of fee content! Specifically free online videos and course work. I know I linked so some of it in my resources post but here is some more to wet your palate. Youtube is an amazing source of information. If you have internet access you can type in a search for nearly any topic and BOOM, videos at your fingertips. I do recommend Mom search on her own first ahead of time. The web can be a bit wild so you don’t want any accidental surprises. Similar things can be found on Netflix which is a pretty darn cheap subscription if you can swing it. Lots of cable channels put at least some of their content online for free every day. Sites like Discovery Kids, PBS, and PBS Kids offer free online content. I also found and bookmarked THIS site with a list of 25 other sites all with free online learning content. Did you know MIT… yes THAT MIT, even offers a great deal of coursework for FREE right on their websites? Here is a link to get you started. I hear Yale has something similar. Nasa has some fantastic video on their website too. Have you seen Kahn Academy? Here is a fantastic, high quality resource for teaching your students Math, Science, and Humanities courses. It is quite unbelievable what is available for free on that website. I point this one out on it’s own because it is just such a deep and vast resource. It can’t be missed. Honestly, my list in this space could go on for ever. Google is my friend! And can I put this out there? Do you blog? Have you thought about it. If you are an active homeschool blogger you CAN get some very nice curriculum to review for free. It takes hard work and dedication to maintain a blog and develop a following of readers. Then there you do have to spend time and heart energy reviewing the materials sent you are sent. It is no cakewalk for sure. I myself loose many hours of sleep keeping this place going and working hard on my reviews not only so that my family can be blessed by the things we receive but so that all of my readers and the publishers of the curriculum I am given can be blessed too. My children are obviously involved too and my husband definitely supports me. It is a total team effort. However, I know plenty ladies who are able to school all of their children almost entirely on products they get for free. If you are willing to work at it, it can be done! Just something else to think about. If homeschooling is a priority for your family, something you are willing to sacrifice time and energy for, then I totally believe it CAN be done without breaking the bank. With a little enginuity you can homeschool for next to nothing! 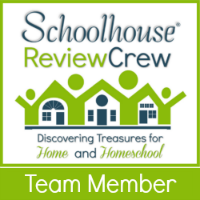 Click here to read more about how other families pinch the homeschool pennies. Please, if you have any resources to share with my readers leave on comment below! It would be a true blessing.